Swensen’s Philippines brings its premium creamy bliss to more ice cream fans as it opens its 3rd branch at SM the Block. Get your ultimate sundae experience by indulging in Swensen’s all-natural premium ice cream as “Good as Father Used to Make”, as Earl Swensen puts it when he founded this ice cream parlor in 1948. Curious about what makes Swensen’s a top ice cream brand in America? Go to Swensen’s SM the Block and have a taste of its extraordinary explosion of flavors! There are over 180 ice cream concoctions to choose from. 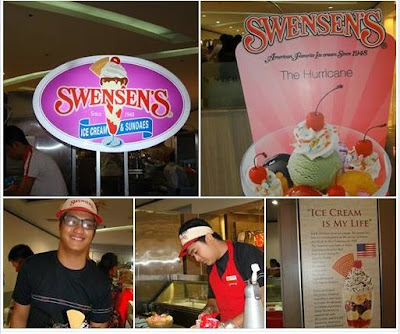 Swensen's offers a wide variety of mouth-watering treats from scoops to sundaes, floats, parfaits, and shakes. The vanilla, chocolate, mocha and other fruit flavors are thick and flavorful. Everything is so creamy and delicious. The ice cream has smooth texture which gives a tell tale sign that it is not sourced locally. Premium quality comes with a price though. Whatever mood you’re in and whatever flavor you like, Swensen’s has it all! You will surely delight in a little Swensen’s indulgence. Their ice cream is like heaven on earth!